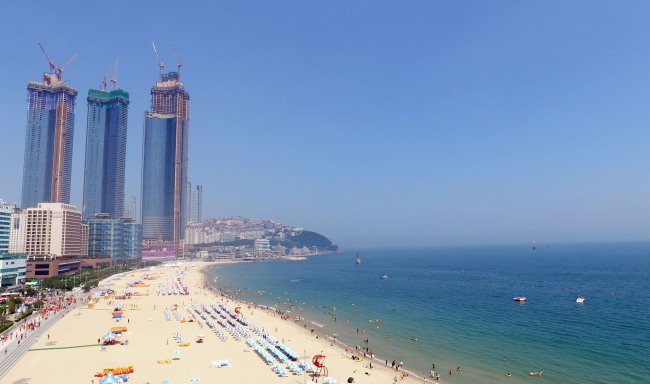 More foreigners have shown interest in visiting South Korea's southeastern port city of Busan, industry data showed Wednesday, amid the government's efforts to pursue balanced regional tourism growth. According to the data from Skyscanner, an online site that compares trip prices, the number of searches for a round-trip ticket to South Korea from abroad in the July-August period on its website increased 63 percent on-year. Among others, Busan, the country's second-largest city, located 450 kilometers south of Seoul, saw the comparable tally increase 87 percent on-year, followed by Daegu, some 300 km south of the capital, with 70 percent and the southern resort island of Jeju with 69 percent, according to the data. The most popular tourism destination for foreigners was Seoul, followed by Busan, Jeju and Daegu, it showed. While there is still a lot of demand for trips to the capital city, the number of people who prefer to travel to other cities without stopping by Incheon seems to have grown on the back of increased regional flights and improved tourism infrastructure, the company said. Incheon, west of Seoul, is the home of Incheon International Airport, the country's main gateway. The number of passengers using Gimhae International Airport in Busan, meanwhile, has been constantly rising, reporting a record high 8.6 million in the first half of the year, it added.